Guruji Shri Narendra Babu Sharmaji has started new section in his Bruhat Brahmanda programme called Ashtadasabhuja Durga Darshana. In which Guruji reveals the details on Lalitha Sahasranamam. Guruji have divided the Lalitha Sahasranamam into 18 sections, he plays each section and reveals the Goddess Durga Temple related to it. The Fifth Temple in Ashtadasabhuja Durga Darshan is Sri Kamakshi Amman Temple, Mangadu. The Lalitha Sahasranama verse played by Guruji, is given below. Mangadu is a small town situated 24 Kilometers away from Madras in between Kundrathur and Poonamallee. In this Mangadu the Goddess Sri Kamakshi came and started her penance standing on the PANCHAGNI in the midst of forest of Mango trees. 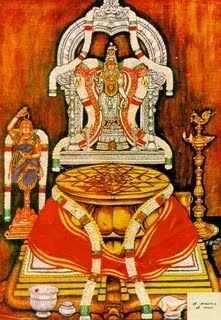 Then Lord Siva appeared before Goddess Kamakshi and married her at Kancheepuram. 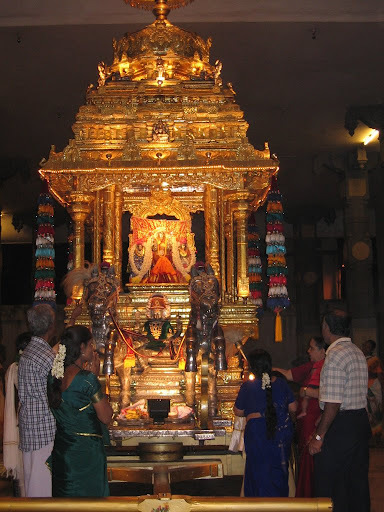 In the same way, if any unmarried Girl, comes and offers vows to Sri Kamakshi, she gets married very soon. Siva and Devi were sporting in their garden in the Mount Kailash. Devi in her playful mood closed the eyes of Lord Siva. Immediately the whole creation fell into eternal darkness. Goddess craved Siva's pardon. Lord Siva directed Goddess to the earth for performing severe penance. Goddess came and started her severe penance on the Panchagni in Mangadu. Goddess performed penance on the Panchagni, resting the left leg on the Panchagni,folding the right leg. Her left hand is raised above her head, holding a jabmala. This can be seen in this Mangadu Temple as Tapas Kamakshiamman. When Goddess Left the place without extinguishing the fire the whole area suffered from the unbearable heat for a long time. Sri AdiSankara of Kaladi came here and installed SRI ARDHAMERU CHAKRAM and extinguished the fire. SRI CHAKRAM in Mangadu is very rare in India. The Ardhameru Sri Chakram is the cheif divinity in this temple. Kumkum Archana is performed and no abhishekam for Sri Chakram, since it is made up of herbals. 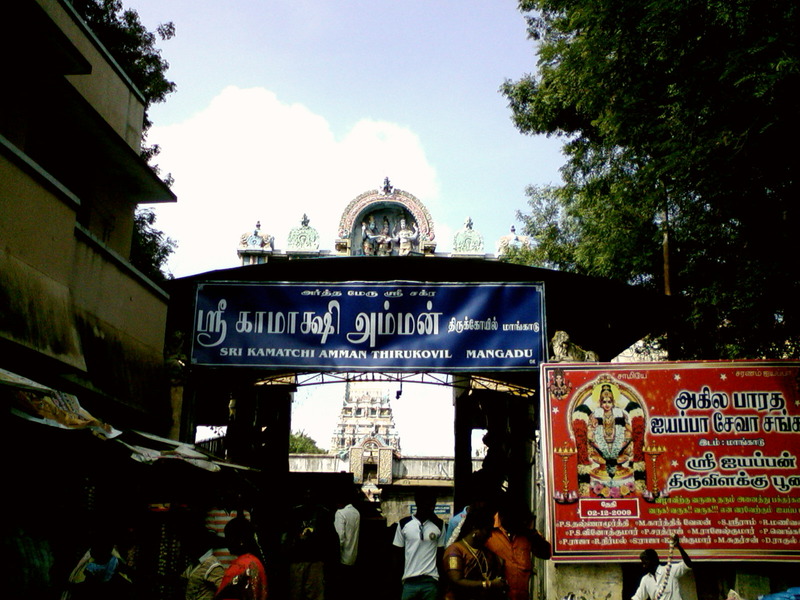 Sri Adhi Kamakshiamman (in Panchalogam) has been installed in the sanctum by Sri Kanchi Paramacharya Swamigal. Worshipper can choose any one day in a week for worship. They have to repeat the worship on the same day next week for seven times (one Mandalam). Every time two fresh lemon fruits are to be offered and they have to get back one lemon and the same has to be kept in the pooja. When they come next week, they have to bring the old, which was kept in pooja,with two other fresh lemons.